Dogs Welcome! 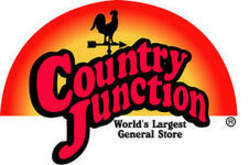 Country Junction a best place for family fun including your furry friend. While you shop the World's largest general store, visit our pet store and have your pet pampered at our Pet Parlor. Contact us for dates on vaccine clinics, pet costume contests, photos with Santa and the Easter Bunny and other pet friendly events. Country Junction takes great pride in and care of our Free petting zoo. Before you leave stop by Pappy's Farm and feed our special friends. Stroll the yellow brick road for a fun shopping experience.